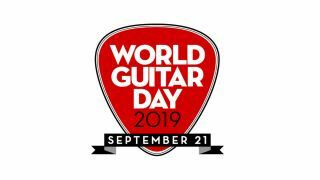 On Saturday 21 September 2019, the global guitar playing community will come together once again to celebrate World Guitar Day, a special on- and offline celebration of all things electric and acoustic guitar. World Guitar Day is a unique opportunity to salute the players who have shaped guitar music, to acknowledge the unique spirit of the worldwide guitar playing community and inspire future guitar stars. Mark the date on your calendar today! Throughout World Guitar Day, guitarists will have access to exclusive interviews, live Q&As and blogs with a ‘who’s who’ of guitar celebrities. Past World Guitar Day celebrations have seen us delve into the subject of guitars and mental health, host Facebook Live sessions with Joe Satriani and Halestorm, and publish exclusive new interviews with everyone from James Bay to Tom Morello. Aspiring players will benefit from FREE guitar lessons to help them kickstart their own guitar playing journey. More established guitarists will have the opportunity to improve their technique, sound and songwriting through expert tips and tutorials. The day itself will also see the climax of our Guitarist of the Year competition, a global talent contest searching for the best bass, electric, acoustic and young players. Finalists will duke it out live on stage at the UK Guitar Show in London. Full details, including how to enter, plus announcements of star judges, prizes and sponsors coming soon. World Guitar Day is set to be the biggest guitar event of 2019. You can get involved by spreading the word through your social channels, using the official hashtag #WorldGuitarDay, and preparing your own content for the big day. We want to see pictures of your guitar collection, find out how you started playing and what the guitar means to you. Get involved and you could be joining the ranks of Paul McCartney , Slipknot, Sky Arts, BBC 6 Music and even this kangaroo, who all declared their love for the guitar during the 2018 event. World Guitar Day will be hosted by MusicRadar.com and loudermusic.com, in association with leading guitar, rock and heavy metal brands Guitarist, Total Guitar, Guitar Techniques, Classic Rock, Metal Hammer, Bass Magazine, Bass Player, Guitar Player and Guitar World.